Hasbro is assembling new Dungeons & Dragons play sets for 2014. Tabletop role-playing games are beloved by their players in no small part because of the freedom they grant to build experiences and worlds of fantastic proportions. 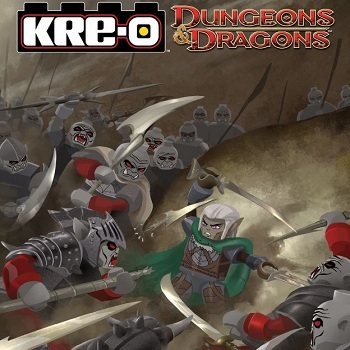 Perhaps seeing some parallels between that experience and the joys of building with tiny plastic blocks, Hasbro, Inc. has announced that it will soon be launching a new line of its KRE-O construction sets based on Wizards of the Coast's Dungeons & Dragons game. The announcement came at Comic-Con International where the company revealed the new line of toys in addition to showing off its recently revealed Cityville Invasion line. "Since launching the KRE-O brand over two years ago, we've been able to tap into some of Hasbro's most iconic brands and premier pop-culture licenses and bring them to life in a whole new way for kids and fans," said Kim Boyd, Senior Global Marketing Director for the KRE-O brand. "We are excited to add fantasy inspired sets featuring DUNGEONS & DRAGONS as well as CITYVILLE INVASION to the KRE-O portfolio." The new Dungeons & Dragons sets, due for release in 2014, will be joining other geek friendly KRE-O lines including Star Trek, Transformers and G.I. Joe. While we wait for them to hit store shelves, we can't help but wonder how in-depth the KRE-O D&D play sets are going to be. Anyone who's ever played a tabletop role-playing game can tell you that sometimes the supplies for it can get expensive. Depending on what's offered by the forthcoming KRE-O sets, we could see some players using them to build environments for actual D&D games.